After serving the Oklahoma Cattlemen's Association for seventeen years, the Executive Vice President of the organization, Scott Dewald, has announced he is leaving OCA to become the President of REI- the Rural Enterprises Incorporated, based in Durant, Oklahoma. According to the REI website, "REI Oklahoma announces Oklahoma Cattlemen’s Association Executive Vice-President Scott Dewald as its new President and CEO, effective April 1, 2013. Dewald and his family were honored by the OCA and Oklahoma Agriculture on Thursday evening, March 28th for his many years of serving the OCA, the Oklahoma Cattle Industry, Oklahoma Animal Agriculture and really all of Oklahoma Agriculture. Presentations were made to Scott by Oklahoma Secretary of Agriculture Jim Reese, Oklahoma Pork Council Executive Roy Lee Lindsay, the Reed Center and by Mike Frey, President of the Oklahoma Cattlemen's Association. 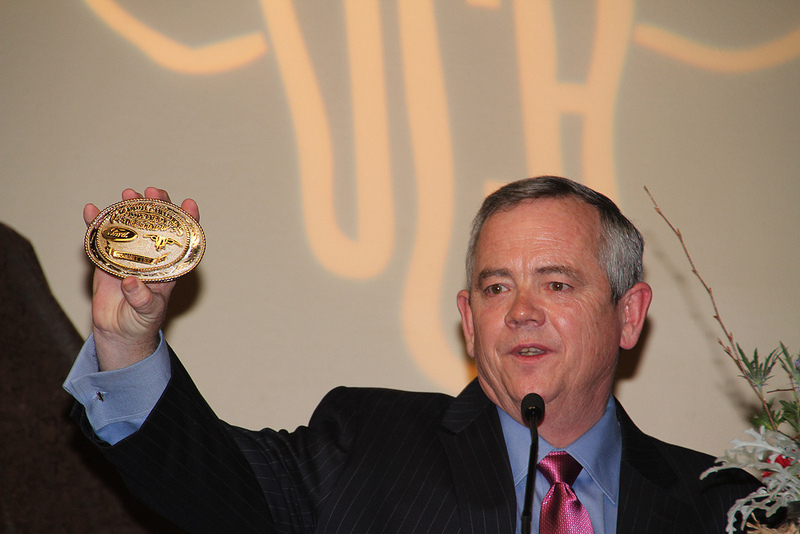 The picture above is Scott holding a belt buckle given to him by Rusty Martin, the Chairman of the Range Roundup Committee. We took a few photos of the evening- click here for our FLICKR set of pictures entitled Scott Dewald Celebration. Ron Hays talks with Scott Dewald as his 17 year career with OCA comes to an end.